Guild Wars 2 is the follow-up to 2005's critically acclaimed massively multiplayer online role-playing game (MMORPG), Guild Wars. Currently in development by AreaNet, the next instalment to the online role-playing franchise is expected to land in late 2012. We bring you all the latest news on trailers, gameplay and characters for what is sure to be another online smash. 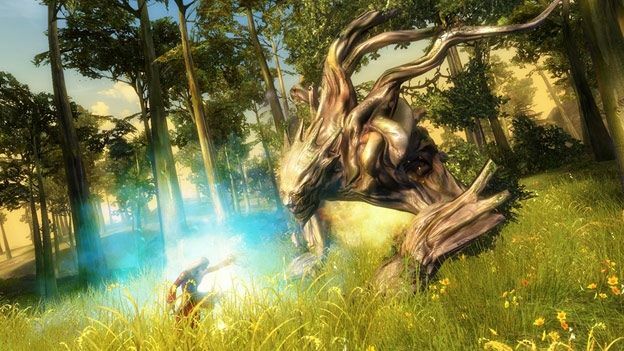 AreaNet has confirmed that the Guild Wars 2 release date has been confirmed for August 28 in the UK. The game is currently available for pre-order on the Guild Wars 2 website. Unlike World of Warcraft, players aren't tied to a monthly subscription with GW2 – only a one-off payment for the game. The standard Digital Edition is available for pre-order for £49.99 via the official Guild Wars 2 website. Gamers must fork out £64.99 for the Digital Deluxe Edition but will receive a catalogue of exciting skills and features, including Summon Mistfire Wolf Elite Skill (players can summon a four-legged companion to help them during combat), Golem Banker (a manservant that grants players access to their account storage from anywhere in the world) and Chalice of Glory (a special chalice used to unlock rewards). A price point has yet to be allocated to the Collector's Edition but we'll update this post as soon as it's announced. For years, the continent of Tyria has been savaged by war and chaos. Five races – the ferocious Charr, the magical and canny Asura, the shape-shifting Norn, the secretive Sylvari and the humans – have locked horns in a bid to gain supremacy. But an unlikely scenario threatens their pursuits – the awakening of the mighty and powerful dragons. Fuelled by their blood-lust, the creatures wreak havoc across the land, leaving a pile of destruction in their wake and enslaving Tyria's once-warring habitants. Now a select group of heroes from each of the five races must unite – setting aside their differences – to bring down their common enemies. Only once the beasts have been defeated can life in Tyria return to normality. ArenaNet is giving players the opportunity to participate in early versions of the game during special beta events, which will be held in English, German and French. By doing so, the company is hoping to coax feedback from players and develop the game using that information. The first beta event took place in April, however, AreaNet will host several more in the run up to the game's official launch, T3 understands. The company has stated that it will confirm the full GW2 release date once it's satisfied with the feedback it's received from these events. All participants are required to sign a Non-Disclosure Agreement (NDA). This is a legally binding agreement which states that gamers cannot pass on information about what they've seen, heard or done while in the land of Tyria. They cannot even disclose whether they were a participant – that's how strict the rules are. Breaking the NDA could lead to legal action being taken against them. As you'd expect there are a magnitude of awesome features on offer in GW2. First and foremost, self-confessed non-team players have the option of going solo and advancing their character to his/her optimum level without any third-party help. At the same time AreaNet is stressing the importance of belonging to clan, as the game will feature several challenges that'll require a bit of team work. Another stand-out feature is underwater exploration. Players will have access to several underwater zones that open up a window of opportunities to discover new and exciting areas without fear of drowning. Players unfortunately cannot play as their original Guild Wars characters in GW2 but are able to secure rewards based on the achievements of their original characters using the Hall of Monuments in GW2. Charr: The Charr are a vicious and belligerent race, hostile to anyone and anything outside their clan. The conquerors of Ascalon, these warmongering creatures are valuable companions on the battlefield – just don't try to pet one. Norn: Not as friendly as the giant on the sweetcorn tin, these towering brutes can shape-shift into hideous creatures and dish out their fair share of pain. You'll find them dwelling within the dwarven ruins of the Shiverpeaks, where they regrouped after forcibly being kicked off their own turf. Asura: The Asura possess the most powerful weapon of all: brain power. This intelligent race once ruled the tunnels beneath Tyria's war-torn crust but have since emerged to rid their land of the mighty dragons. Sylvari: A secretive race, not much is known about these plant-beings only that they're new to Tyria and are united in their pursuits and fearsome power.